Did you file a joint income tax return and expect to get a big check back from Uncle Sam only to find out that the government kept all or part of your refund? If so, the feds probably think you – or your spouse – have a delinquent debt that must be paid before you can enjoy a tax return. What kind of obligations can wreck your refund check? Anything from you or your spouse’s defaulted student loans to past due child or spousal support payments to overdue federal or state income taxes. 1. To be considered an injured spouse, you must have made and reported tax payments, such as federal income tax withheld from wages or estimated tax payments, or claimed a refundable tax credit, such as the earned income credit or additional child tax credit on the joint return, and not be legally obligated to pay the past-due amount. 2. If you live in a community property state, special rules apply. For more information about the factors used to determine whether you are subject to community property laws, see IRS Publication 555, Community Property. 3. If you filed a joint return and you’re not responsible for the debt, but you are entitled to a portion of the refund you may request your portion of the refund by filing Form 8379, Injured Spouse Allocation. 4. You may file form 8379 along with your original tax return or your may file it by itself after you are notified of an offset. 5. You can file the Form 8379 electronically. 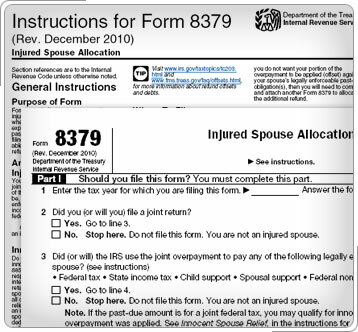 If you file a paper tax return you can include Form 8379 with your return, write “INJURED SPOUSE” at the top left corner of the Form 1040, 1040A, or 1040EZ. IRS will process your allocation request before an offset occurs. 6. If you are filing Form 8379 by itself, it must show both spouses’ social security numbers in the same order as they appeared on your income tax return. You, the “injured” spouse, must sign the form. 7. Do not use Form 8379 if you are claiming innocent spouse relief. Instead, file Form 8857, Request for Innocent Spouse Relief. This relief from a joint liability applies only in certain limited circumstances. IRS Publication 971, Innocent Spouse Relief, explains who may qualify, and how to request this relief.